Tweet Seattle band Amber Pacific recently released the album “Virtues” on Victory Records. “Virtues” features the single “Three Words.” “Virtues” is the third studio album (first with Victory Records). 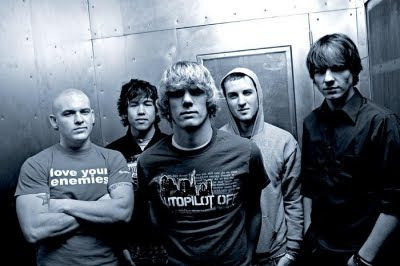 Amber Pacific has also released four EPs and played on “Vans Warped Tour” on three separate occasions. I recently sat down with lead guitarist Will Nutter. Q - How would you describe Amber Pacific's sound? A - I would say we're a smoothie of Pop, Punk, Rock, and Alternative, served with an energy boost. Q - Your album "Virtues" came out a few months back. How has the writing process changed compared to your earlier albums? A - The writing process was no different on this album from the last, I still wrote the songs. I'd say having Jesse in the band added an additional writer to the band and his song “Three Words” actually turned out being our first single! Q - Do you find it easier to write on the road or when the band has some time off? A - I've never been able to write on the road, I've written almost every Amber Pacific song at home for the most part. I think being comfortable with your surroundings is important and you just can't get the space you need on the road sometimes to connect with the writing. Q - What is your favorite song off of "Virtues" and why? A - My personal favorite is "Forever." It has a very special meaning to me as it was a song written about my grandfather passing away while recording the record. It was a late addition to the record but I'm glad it made it. Q - What is your favorite song to play live and why? A - I would have to also say, "Gone So Young" is my favorite because it's a crowd pleaser and also has very special meaning to me as it was a song written about a close friend in high school who was involved in a fatal car accident before my senior year. Q - You guys have been a part of the "Warped Tour" three separate times. Are there any plans to join the tour again? A - We were actually a part of the Vans Warped Tour four years in a row; we definitely plan on joining up with them again sometime! Q - What did you learn from being on such a big tour? A - I think the biggest thing we learned was hard work can go a long ways; I think our band would be in a different place had we not put in the effort. Q - Who are some of your earliest influences? A - BLINK 182 and The Early November. A - Green River Ordinance, such a great band with solid songs. Q - Are there any artists that you are a fan of that would surprise your fans (a guilty pleasure)? A - I love everyone, literally. A - Hopefully we can land a big fall tour supporting some friends; time will tell. Q - What is your most embarrassing stage moment? A - I don't have anything that sticks out in my head other than constantly hitting myself in the face with my mike. A - Thank you to all the AP supporters out there and to you for the interview. You can pick up “Virtues” in stores now. Check out Amber Pacific at www.myspace.com/amberpacific.